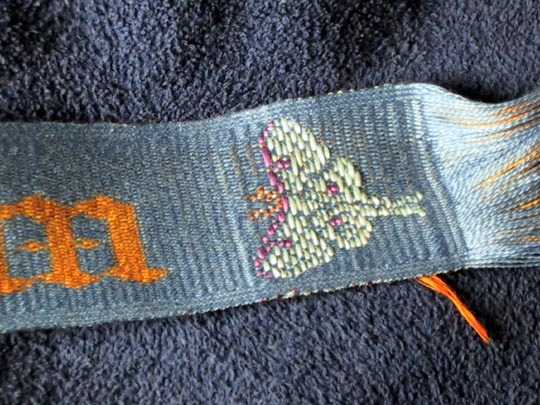 This is my second attempt at beetle wing embroidery. I learned a lot about goldwork, reading Tanja Berlin’s website, and I bought some supplies from her. I also learned a lot about lighting this kind of photography, and I think the shots turned out much better. Ironically, the solution that worked best was a simple one – stood outdoors in slanting full sun, and positioned the piece so that it was covered by my shadow. For some of them, I used an additional reflecting card to get bounced soft light. 0 0 Michael Michael2006-12-20 10:59:002006-12-20 10:59:00Counting down! 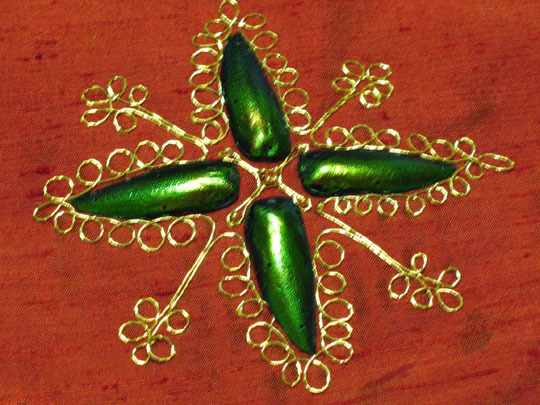 This is an experiment in beetle wing and goldwork embroidery. These are wings from the Thai Jewel Beetle, Sternocera aequisignata. The goldwork design is based off of one I found online. 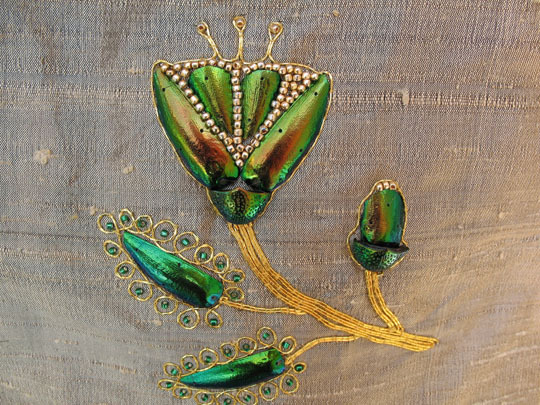 Beetle wing embroidery was popular in parts of India and the East, and came to England during the Victorian period by way of the East India Company. For those of you who know a lot about photography, I also have a question, behind the cut. I pierced the wings with a sharps needle after steaming them for five minutes, and then attached them and the gold to a piece of felt-backed silk using invisible nylon thread. The gold is Kreinik #7 Japan Gold. Air Date for the That's Clever show! I’ve gotten an air date for the HGTV segment that was shot last spring! 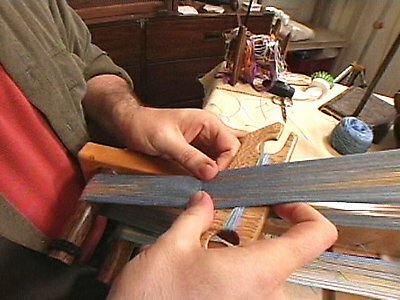 They filmed the whole process from raising the silk worms, to weaving theribbon – it will be interesting to see how they edit it together tomake it look cohesive, because there were some gaps like they didn’t show the twisting or dyeing. is the episode’s page; it’s expected to air on January 5 at 1 PM PT/ET. 0 0 Michael Michael2006-12-13 14:28:002006-12-13 14:28:00Air Date for the That's Clever show!